Literary Hoots: The School is Alive! Sam Graves is Eerie Elementary's newest hall moniter. And besides having to wear a horrible bright orange sash, he soon finds the role will earn him some enemies—the first and foremost being the school itself! Barely surviving the playground quicksand and the tentacle-like fire hose, Sam's not sure he can take on this monster of a school—especially when it seems no one else notices what's going on. Yet, with the help of the wise old caretaker and Sam's friends, Sam trains for the day the school will make its most dangerous attack. Will he be ready to fight? I've been seeing books in this series pop up more and more and decided it was about time I gave it a try. And wow, this was creepier and more exciting than I expected! The high-action plot, bold onomatopoeia, and plentiful illustrations is sure to keep young readers engaged and excited. 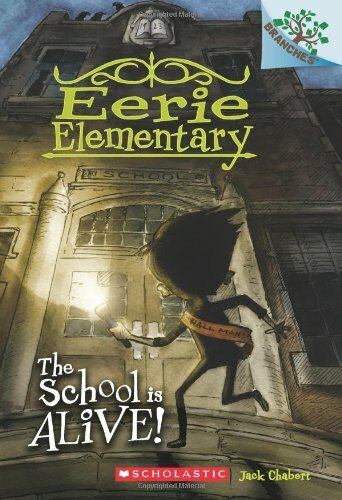 I really enjoyed some of the scares and thought the illustrations did a good job of balancing the scary with some cartoonish fun. The story, in the end however, was not my favorite. Such a high action plot leaves a lot to be desired in the characters. Sam has some key moments of bravery and humor, but that's about it. His two friends, Antonio and Lucy, are especially flat. I'm hoping the later books in the series do them more justice. Overall, the complaint about the characters is my own preference. Really, kids are going to enjoy this. And parents will appreciate the good vocabulary and page count. It's a great precursor to Goosebumps and other such horrors.